Is the Kalman Filter a Best Linear Unbiased Estimator (BLUE) for Heteroscedastic Noise? According to the Gauss-Markov Theorem, a ordinary least squares estimator is BLUE if the noise entering a system is uncorrelated with zero mean and is homoscedastic (has a constant finite variance). I am aware that a Kalman Filter applied to a system with additive noise of known mean and variance but non-gaussian distribution is BLUE. Does this imply that the noise has to be homoscedastic ? Or does the KF have a trick up its sleeve ? Kalman filter is the best linear estimator regardless of stationarity or Gaussianity. Also in the Gaussian case it does not require stationarity (unlike Wiener filter). 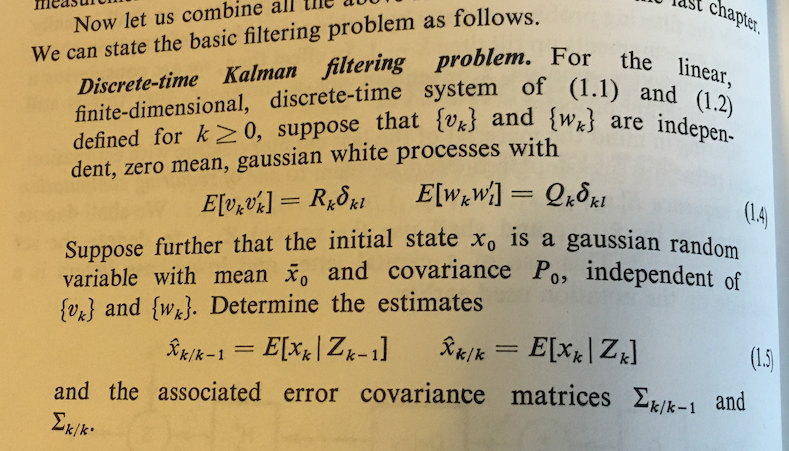 In the linear Gaussian case Kalman filter is also a MMSE estimator or the conditional mean. The covariances $R_k$ and $Q_k$ are time-varying. Moreover, later in Chapter 3, they go on to prove the best linear estimator property for the Kalman filter in Theorem 2.1, and the proof does not appear to require the noise to be stationary. Now: the question will be whether the Gaussianity assumption can be dropped... but I've not read through it. Most of the standard KF equations state assume Gaussianity; as does this one. Not the answer you're looking for? Browse other questions tagged noise kalman-filters least-squares or ask your own question. Does receiver always know about the noise level in real world application?